Mud Sling은 뒷바퀴를 통해 타르, 진흙, 돌맹이등으로 인하여 뒷쪽 서스펜션과 ESA등 그 주변이 피해를 입는것을 방지하여 줍니다. 순정이나 타사 제품에 비해 보호범위가 200% 넓습니다. 프로로필렌으로 제작되어 파손위험이 없고 탄력이 있어 충격에도 쉽게 복원됩니다. 순정 부품과 질감이 비슷하여 장착시에 위화감이 없으며, 장착시간은 5분이내로 쉽습니다. BMW 사이드 케이스와 장착되며, 투라텍 Zega Pro, Jesse 사이드 케이스와도 동시에 장착할수 있습니다. 다만 헵코앤베커와는 동시에 장착할수 없습니다. 2014 R1200GS 어드벤쳐에 오프로드 타이어가 장착되어 있는경우에는 이 제품이 장착되기 어렵습니다. 일반적이 로드용 타이어(출고 타이어나 메츨러 투어런스 넥스트, 컨티넨탈 트레일 어택)에는 장착 가능합니다. 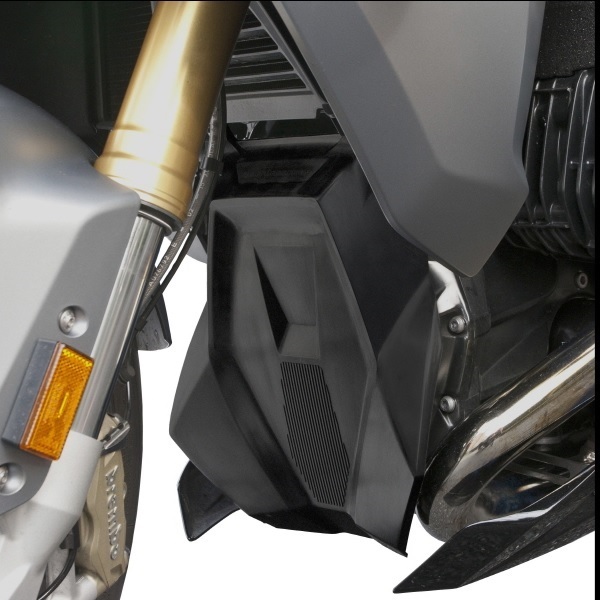 BMW has, for the first time, provided a small rear fender on this new GS, but it is insufficiently long and wide enough to divert mud from the rider and surrounding components. 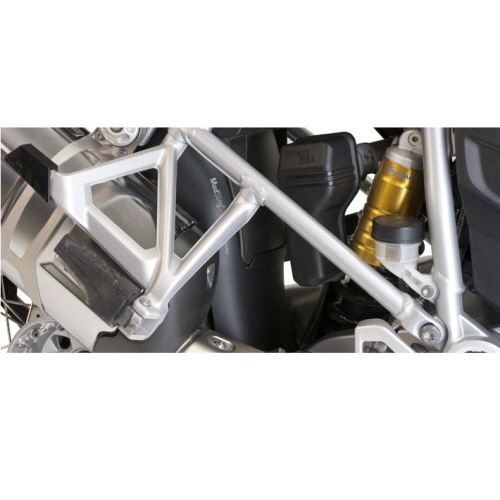 The MudSling_LC mounts to the existing short fender and sides of the frame in between the rear tire and suspension, increasing the surface width to each side up to 3" and downwards 7" for a total of 200% more coverage area than stock. 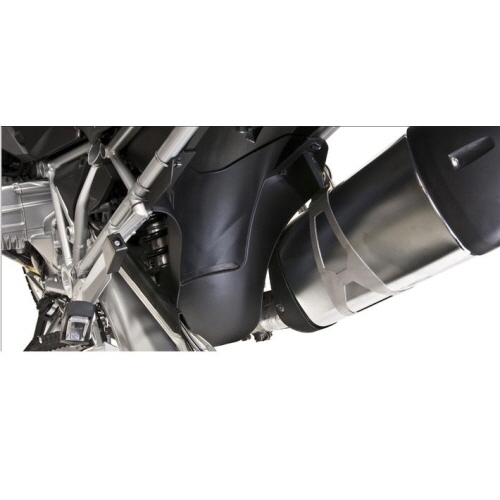 It protects the rear shock and surrounding areas from rock scrape, mud and tar accumulation. 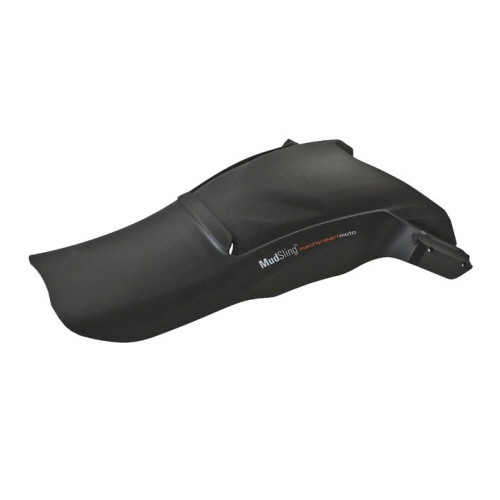 MudSling_LC is injection molded in resilient polypropylene with a fine texture matching other molded surfaces on the GS. 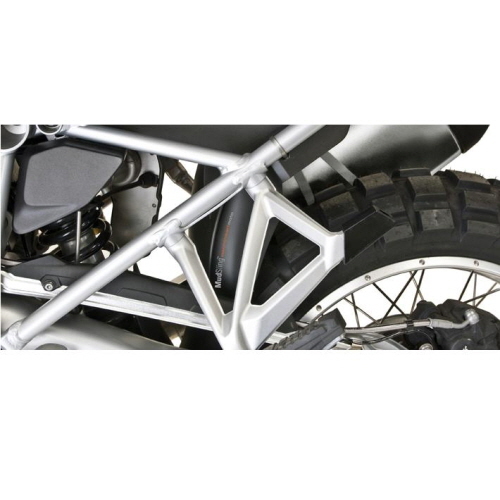 It is precisely shaped to engage the bottom of the existing fender and fits tightly against the frame where it is secured. Installation takes less than 5 minutes. 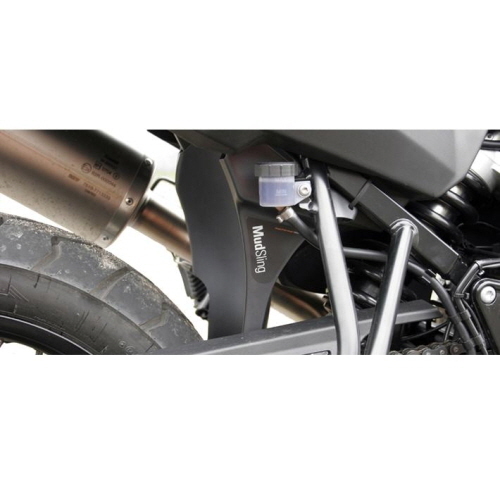 It fits with BMW stock pannier mounts for both the GS and ADV, as well as Touratech Zega Pro, and Jesse. It does not fit with Hepco Becker mounts. Please note that the MudSling does not fit the 2014 Adventure fitted with knobby tires. Read the Bogroll entry below for more information. 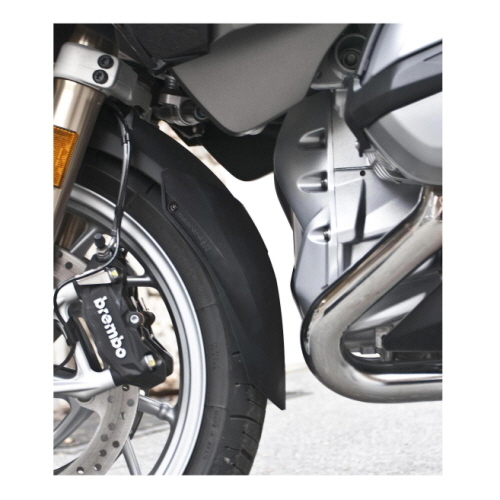 Certain knobby tire profiles are also not compatible on the standard GS. So far we have verified only the Mitas 07 knobby. More knobby tire compatibility information will be related here over time. 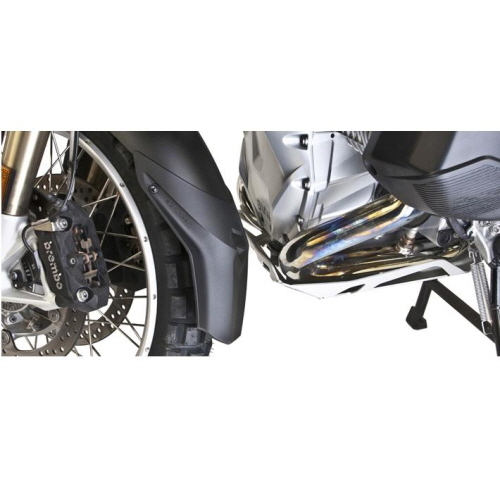 The standard fitment street biased dual sport tires, like the Metzeler Tourance Next and Continental Trail Attack, fit well with the MudSling. The MudSling 12GS_LC continues the MudSling tradition of enhanced functionality, attention to detail, and quality appearance.